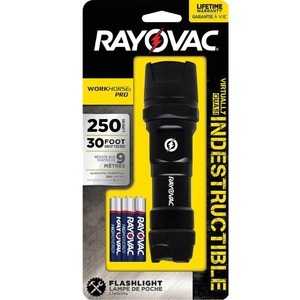 Industrial-grade flashlight with included batteries offers powerful durability in a simplistic design. High-performance LEDs cast 250 lumens of bright light up to 524'. Energy-saver mode reduces power consumption for extended battery life. Aluminum-titanium casing with shock absorbers is able to withstand a 30' drop for virtually indestructible use. Built-in thumb area offers an ergonomic grip for comfortable handling. IPX4 water-resistant design resists being damaged from liquids.